Animal glue, also known as hide glue, bone glue, or protein glue, has been in use for as long as humans have been trying to stick things together. Throughout ancient times and into the modern age, animal glue is still the go-to choice for many professional craftsman, designers, and manufacturers. Despite its long history, many misconceptions persist about the production and use of animal glue. The rise of myths and drop in popularity of animal glue is due to the development of synthetic adhesives. The creation of polyvinyl (PVA) glues, vinyl acetate ethylene (VAE), and vinyl acetate acrylates (VAA) took the manufacturing world by storm in the 1950’s, but animal glue is still holding on! Let’s bust some myths that adhere to the manufacturing process and use of hide glue and find out why it’s still sticking with manufacturers centuries later. Fact: Modern animal glue is made mainly from recycled gelatin. This is probably the first thought that came to mind, right? Traditionally, hide glue was manufactured by boiling animal skin, tissues, and bone to extract the collagen, or gelatin. Hide glue has been around for thousands of years, and the manufacturing process has evolved significantly since then. The stereotype of the old horse being led to the glue factory is just that, a stereotype. While bovine and porcine hides are still used in animal glue production, the predominant ingredient in modern animal glue is recycled gelatin. As one of the largest and oldest glue manufacturers in the United States, our team at LD Davis has personally overseen and had a hand in the shift in the manufacturing process. In the 1970s, we started utilizing recycled gelatin from the pharmaceutical industry, revolutionizing how hide glue is produced. The pharmaceutical industry is one of the largest users of pharmaceutical grade gelatin, as it’s most often used to develop soft gel and hard pill capsules. The leftover gelatin netting from the pill punching process would typically be considered waste, but by boiling it down and combining it with other raw materials, we were able to develop a non-toxic, environmentally friendly glue. To see how we make our protein glue in-house, watch our production process. Fact: Animal glue is non-toxic. As mentioned above, hide glue isn’t toxic because its main component is gelatin, which is extracted collagen. Remember those delicious juices that collect in the pan when you bake, say, a roasted turkey in the oven? Those fatty, jelly drippings are collagen, which is naturally found in bones and connective tissues. By simmering animal hides and byproducts in water and other aromatic for about 24 hours, the collagen is released and can be further processed into gelatin. Animal glue naturally contains two types of proteins that make it a great adhesive: chodron, which increases the glue’s strength for bonding, and gluten, which increases gelling strength for tackiness and hardness. Animal glue is completely biodegradable and the raw materials are naturally recyclable, making protein-based glues a more environmentally friendly adhesive than polymer-based adhesives. Aside from the proteins already present in hide glue, other eco-friendly common ingredients include water, glycerin, Epsom salt, and corn sugar. Fact: Animal glue can have a long shelf life when stored in the right conditions. When stored properly, hide glue can be kept for a long time. Dry glue can have a shelf life of several years if sealed and stored in a cool, dry place away from direct sunlight. Cake animal glue, or jelly glue, can have a shelf life of up to about one year. Remember, the main ingredient in animal glue is gelatin, so it should be kept similar to food, as it can spoil if left out. Fact: Animal glue can keep its hold for centuries. If there are any doubts about the long-lasting hold of hide glue, go check out your local museum. Ancient Egyptians were using hide glue 3,000 years ago, and many of the artifacts they left behind are still sticking together. 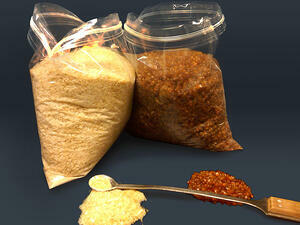 In fact, up until World War II, animal glue was the predominate adhesive used in manufacturing. Joints and surfaces adhered with hide glue are known to be somewhat brittle and will break more easily on shock impact compared to PVA glues. While it sounds counter-intuitive, this property makes hide glue popular for building and repairing furniture and musical instruments. While hide glue is stronger than the wood when cured, substrates can still be taken apart without damaging the wood. The ability to reverse the hold of the glue has allowed craftsman and manufacturers to build, repair, and maintain antique wooden instruments and furniture for centuries. Fact: Animal Glue is Commonly Used in Many Industries. For thousands of years, animal glue was most commonly used in woodworking. 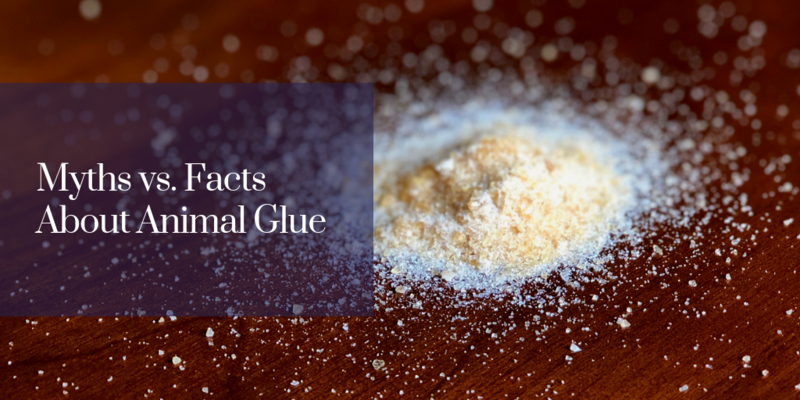 Today, animal glue is still used in industrial manufacturing, often to repair and assemble furniture and wooden instruments like violins, pianos, and cellos, but has many other applications. Fact: Animal Glue is water soluble and easy to remove. Due to having a longer open time than synthetic glues, animal glue is often thought of as messy. Having a longer opening time, however, allows craftsman and manufacturers to work with their products and find the best fit. If glue squeeze-out is a concern, it’s easy to remove animal glue from a substrate by wiping it with a damp cloth or scrubbing it with a toothbrush and warm water. It’s also possible to wait for a few minutes for the glue to gel, and then roll the excess off with your fingers. Unlike modern synthetic glues, animal glue will not cause a permanent stain. Protein glue is also easy to scrape, file, or sand, and these methods only leave a small trace on the wood itself. Want More Hard Facts About Animal Glue? If you are interested in the properties of hide glue and how it can compliment your manufacturing process, contact the adhesive experts at LD Davis.